C.1915, Ansonia, Crystal Regulator No. 3 shelf clock in opalescent gray, as-found. 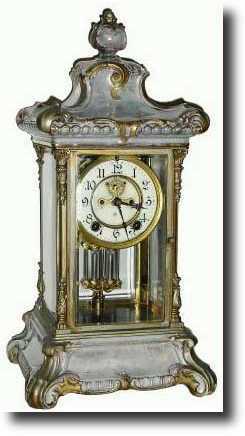 This too, is a decent clock, however, someone at some point touched up all the highlights with gold paint that has now oxidized and discolored. The brass portions have been painted with the same paint. With typical open escape dial and fancy pendulum. Could be cleaned up by someone handy with porcelain. Height 17"